Randolph College’s Science Festival was recently recognized for its impact on the region at the Lynchburg Regional Technology Council’s 2018 Tech Edge Awards ceremony. Randolph received the Technology Program of the Year Award, which recognizes an educational institution or group of students who have shown outstanding achievement in the areas of technology and innovation in the region. The award focuses on creating solutions for pressing technology problems that incorporate social innovation and entrepreneurship. The award may also recognize the creation of new summits and events that celebrate innovation. 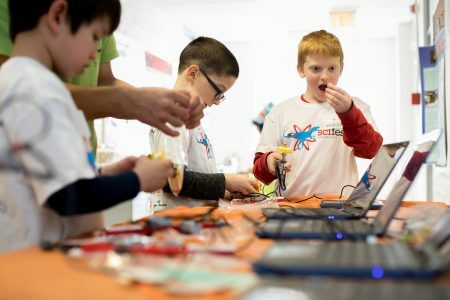 The Randolph College Science Festival, also known as SciFest, is a series of free events each spring that allow the community to discover and celebrate the beauty of science and its connection to many aspects of life. The Randolph chapter of the Society of Physics Students helps run the program, which has something for all ages. SciFest has grown significantly since it began in 2009, and continues to add new attractions each year. Numerous organizations and individuals sponsor the festivities, which draw thousands to the College. The 2019 Science Festival is scheduled March 21-24. The keynote speaker is Robert J. Lang, a physicist who is also one of the foremost origami artists and theorists in the world. Other events include the annual Pi Run, the Poetry Jam! Reading and Competition Awards, Science Day and Maker Faire activities, and the Junior FIRST LEGO League EXPO. For the full schedule and more information about the 2019 Science Festival, please visit www.randolphscience.org.